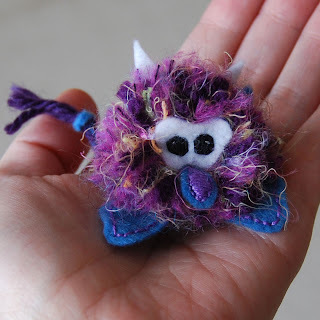 The Itsy Bitsy Spider Crochet: The answer to all my problems is a 'pocket troll' ?! The answer to all my problems is a 'pocket troll' ?! Just sit still. I have to be doing something or making something all the time. If I'm just sitting, I'm either very sick or dead (by the way, please do check before throwing in the "dead" card. That could turn out to be a really bad situation). Throw away scraps. It's not enough to use a ball of yarn all the way down to the last 3 yards. I want to use those last 3 yards too. Whether I put a little embellishment on something or just use the yarn to tie up bundles of sticks... I hate to waste any of it. But, these two little quirks have created some friction for me. For one, I'm a rheumatoid arthritis (RA) sufferer and sometimes crochet just isn't in the picture for me. For anyone who doesn't know about the disease, I encourage you to check out this great link from The RA Warrior (RA 101). But in a nutshell, my hands can become painful and swollen and I've found that continuing to crochet through it is not the best solution. As for the scrap yarn thing, I'm beginning to -- (Ok, so my husband would seriously laugh at my use of "beginning to")... but I'm beginning to amass quite a bit of yarn in quantities that are too small to crochet anything worthwhile. I had been pondering both situations for a while and trying to figure out what to do when I discovered the most amazing device... the Clover Pom-Pom Maker. The other night, I decided to break mine out of the packaging and see what I could do with some of those yarn scraps.... and I made pop-poms.... boy, did I ever make pop-poms! After about 10 or 15, my husband asked me what I planned to do with them. Uh-oh. I didn't have an answer. I played around with them and tried some different things, but today's result has been my favorite so far. I'm calling him a "pocket troll." 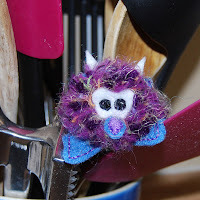 So, I kept busy with something other than crochet and reduced my yarn stash... but the question now is will anyone want a pocket troll? I'd love to hear your thoughts on this little bugger! How adorable AND resourceful! Love your commentary about him as well!